Beers Made By Walking: Walk with Horse & Dragon in Fort Collins, CO! Walk with Horse & Dragon in Fort Collins, CO! 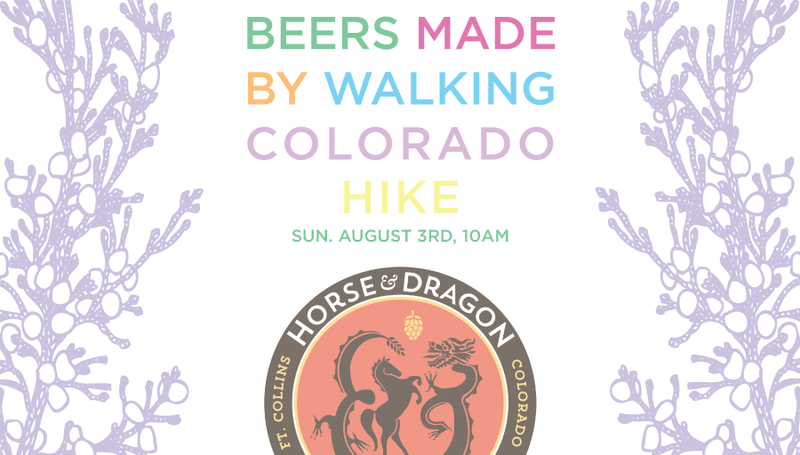 We are excited to announce that Horse & Dragon Brewing Company will lead the second public walk in Colorado for Beers Made by Walking! Join this Fort Collins-based brewery as they walk through The Gardens on Spring Creek this Sunday, August 3rd. Walkers will learn more about edible plants that grow wild in Colorado while the head brewer, Linsey Cornish, will share some insights on her planned brew. The walk will be led by Sherry Fuller, the head of the Garden's adult education program. Brewer Linsey Cornish also attended Copper Kettle's hike last week and is extremely excited about her upcoming beer. The walk is free, as Horse & Dragon is sponsoring the tour! When: Sunday, August 3rd. 10 AM. Where: The Gardens on Spring Creek. 2145 Centre Ave., Fort Collins, CO.
What to Expect: Tons of info on plants in Colorado and a beautiful walk. What to Bring: Water, snacks, sun protection. How to Sign Up: Email Horse and Dragon, send them a Facebook message, or signup in their taproom!